#GetOutside With Us & Turn Black Friday Green! Recently I wrote a blog article about white pine cones, which we are seeing in really high numbers this year. In that article I mentioned that some other trees are producing way more seeds than typical. One of those are our beautiful oak trees. The drought laden, super hot weather in summer 2016 is responsible for this phenomenon too. Oak trees come from two family groups--the red oak group, and the white oak group. Red oak trees have leaves with pointed lobes, while white oak leaves have rounded lobes. Red oak group trees are the most common oaks in Vermont. Like white pines, red oak trees take two years to develop seeds. 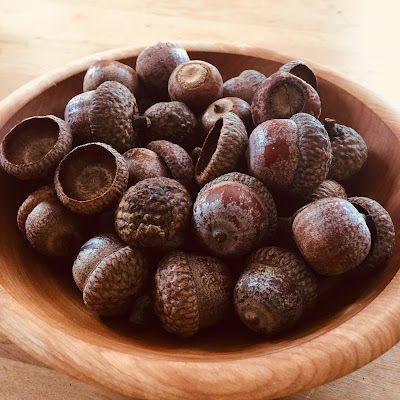 White oak trees develop acorns in one single season. So one factor in this really numerous acorn year is the trees all over producing as a reaction to the 2016 growing season, a very stressful and challenging growing season for all our trees because of the drought. MONTPELIER – This holiday season, Vermont State Parks invites you to purchase holiday gift packages, park passes, and gift certificates for friends and family. Not only will they benefit the recipient, but they’ll benefit the parks, too. 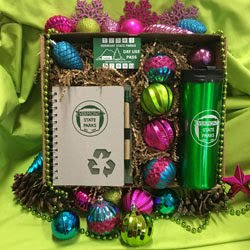 Day Tripper $59 Includes one punch card good for 10 park day visits, a notebook and pen set, and a Vermont State Parks travel mug. Weekend Getaway $89 Includes 2 nights of tent, lean-to or RV camping, a coupon for a free armload of firewood, 2 Vermont State Parks water bottles and a LED mini-flashlight. Why Are There So Many Pine Cones This Year? Our white pine trees--taller than every other tree in the Vermont woods, are heavily laden with cones this year. These giants of the forest started the summer months growing bright green female cones in large clumps at the ends of all the upper branches. The cones were so plentiful, they weighed the branches into curved arches pointing down. Throughout the summer, the seeds hidden under the cone bracts developed, the cones turned brown, and the seeds came sailing out with their adapted wing--hopefully planting some new white pines. At least that is the goal of the pine tree as it grows more and more cones, and more and more seeds. This is the most common question we get during the fall and winter months. The short answer is “yes!” Staff have gone home, and parks are officially closed for the year, but late fall has a start beauty all its' own, and the off season is a great time to visit- for hiking, skiing, snowshoeing, ice fishing, or even a late season picnic. No facilities or services available: restrooms, running water, etc. Carry-in and carry-out everything that you bring with you. Please park only in a manner that allows access by others and please drive only on established roadways or parking areas. This means that when a gate is closed, park outside without blocking, and walk in. In winter, plowed parking is available in certain locations. List of winter access areas can be found here.